Car accidents happen every day in Fort Worth and across the country. In 2016, 4.6 million Americans sought medical treatment for injuries sustained in car crashes and nearly 40,000 people were killed. Ten percent of those deaths occurred in Texas, making it the deadliest state in 2016. The odds that you will be involved in a car crash at some point in your life are high. You can reduce the odds by driving defensively and never allowing yourself to be distracted behind the wheel, but that doesn’t mean another careless driver won’t cause a crash. Rear-end. This is the most common crash and often causes injuries that are not discovered until days later. When a driver is not paying attention or is purposely following the car in front of him too closely, a crash can happen when the driver in front slows or stops suddenly. T-bone. This potentially deadly crash often happens at intersections when a negligent driver runs a red light and hits a car that is passing through the intersection. When there is an occupant on the side of the impact, this type of crash can be fatal. Head-on. When a drunk or distracted driver allows his car to cross the center line into the path of an oncoming vehicle, a head-to-head collision can occur. This kind of crash is the equivalent of driving straight into a brick wall at a high speed. Often, occupants of both cars are seriously injured or killed. Rollover. 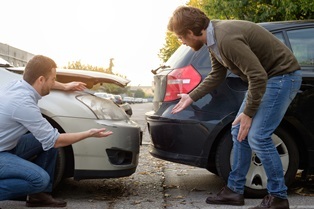 When a car is forced off the road or must make a sudden maneuver to avoid another car or an obstacle, it can roll over, especially if it is a high-profile vehicle like an SUV. These crashes can be fatal for the occupants as they are tossed over and over. If another driver’s actions caused the rollover, he can be held accountable. Hit-and-run. Any time a negligent driver leaves the scene of a crash, it is considered a hit-and-run. If the driver is never found, an injured victim must seek compensation from another source such as his own insurance coverage. If you are the victim of one of these types of crashes, a personal injury lawyer can help protect your right to the compensation you’ll need for a full recovery. Take pictures of the cars involved and the surrounding area. Get the names and numbers of any witnesses at the scene. See a doctor and follow his instructions. Call an experienced car accident attorney. Even if you are unable to do all of these things after a crash, an attorney can help you make the strongest possible claim for compensation. If you are suffering serious injuries following a car crash, you need the help of an experienced Texas car accident lawyer to ensure you’re awarded the maximum possible settlement from the at-fault driver’s insurance company. When injury victims try to negotiate with insurance adjusters on their own, they are often disappointed at the outcome. Fill out the contact form on this page to get started with us today. We've helped hundreds of folks in the Bedford, Arlington, and Euless areas. We are confident that we can help you too. If you retain our services and have any regrets or reservations within the first 30 days, you can walk away free and clear. You really have nothing to lose.